Milestone House has two guest rooms. Both rooms have been newly decorated and offer a high standard of accommodation. The house and garden are no smoking areas. We cannot accommodate pets. 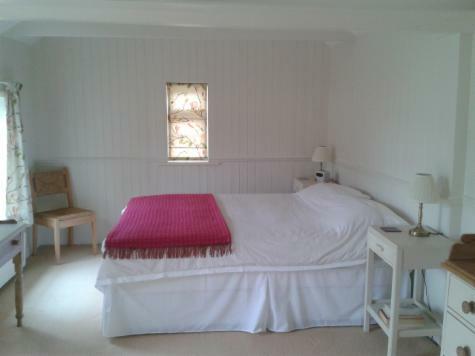 This room is large, light and airy with a high ceiling and has an ensuite bathroom. The room has a kingsize bed, TV with DVD player, WiFi, hairdryer, facilities for making hot drinks and a fridge. The ensuite bathroom has a bath with shower, shaver point and underfloor heating. White Birch is a comfortable bright single room with exclusive use of the large adjacent bathroom. White Birch has TV, WiFi, hairdryer and facilties for making hot drinks. The bathroom has a bath with shower, shaver point and under floor heating. Both rooms can have a cot if required.